Agents and clients are researching you. What does your website tell them? 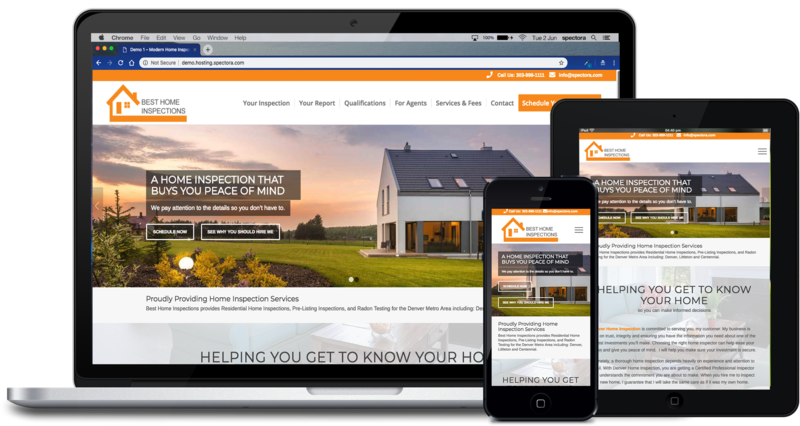 Present a modern, professional appearance when agents and clients checking you out online. Rest easy knowing you’re protected from viruses and spam with automatic security updates. We also back up your site regularly so you'll never lose data. 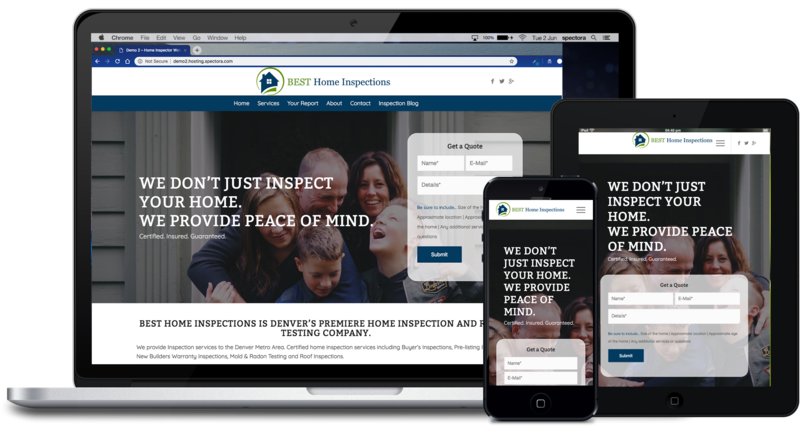 As your company grows your website should reflect your additional services, updated fees, and expanding team. We take care of all those minor updates for you! Prices for websites and Jumpstart Packages will be going up on May 15th. Buy now to take advantage of current pricing! Details here. Because a website is never done... We'll build your website and make any minor edits you need. New services, new photos, new content - we'll be your web team whenever you need us. Includes website design and first year managed hosting. $500 annual hosting fee after first year. 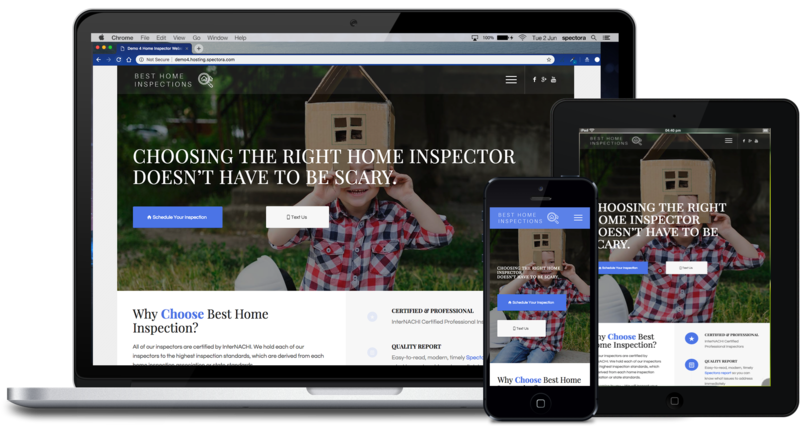 Perfect for inspectors that want to roll up their sleeves and get their hands dirty with website design. We'll show you how to log in and make changes to your website on your own! Any edits after the initial website build are your responsbility. Includes website design and first year DIY hosting. $250 annual hosting fee after first year. Want us to handle your edits? 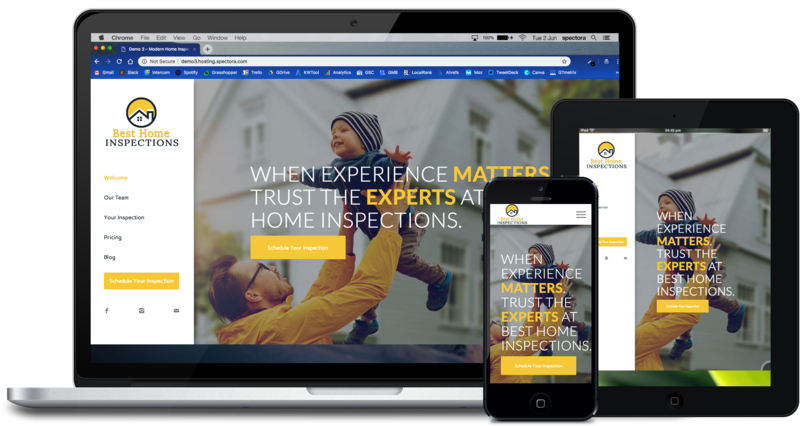 Bundle a website, one year of managed hosting, and one year of software - everything you need to get started as a new home inspector. You'll save over $1k versus buying everything separately. After you pay, we send you an initial questionnaire that helps us learn more about your preferences and what you’re looking for. Once we have all the materials we need, you're given the next available calendar slot for a start date. We go through 2 rounds of feedback during the process to make sure you’re happy. You'll have 3 days for each round of feedback, plenty of time to evaluate. After the final edits are made, we launch your site! We also provide you with a username/password so you have full admin access to the site to make edits anytime. This is where your website "lives". Every website on the Internet has a host - it is the server machine where your files and data reside. There are cheap hosting options out there ("shared hosting") where your website sits on the same server as thousands of other sites. A bug, virus, or traffic spike on any of those other sites may bring down your site as well. A security breach on any site may affect all sites on a shared host. Good web hosting will keep up with the latest security updates, both on the server itself and on Wordpress (including the Wordpress install, theme, and all plugins) to prevent any security issues. Quality web hosting also constantly monitors site speed to ensure sites are loading well. Our hosting uses Kinsta, a Google Cloud Platform that keeps our sites separate and private and running amazingly fast. We stay on top of security updates and constantly monitor our sites. We also have daily backups of all site data. Bottom-line: You get what you pay for with hosting. Don't lose business because your website is slow or prone to failure. What does Managed Hosting mean? Managed hosting means that, in addition to all security updates and server maintenance, we'll handle content changes, updates or other edits for you. We're basically your on-call web developer whenever you need us. This doesn't include total re-designs or massive site overhauls, but rather the normal edits like swapping out photos, adding new services descriptions, adding a new inspector profile, or revising some text. What does DIY Hosting mean? DIY hosting means that while we constantly do security updates and server maintenance on your website, any content updates are up to you (i.e. text, images, pages). Once your site is complete we'll send you a video that shows how to make your own edits so you're able to do so anytime. No, you will need to provide your own domain name. Sites like GoDaddy allow you to purchase domain names, which vary in cost depending on the extension (".com" vs ".net" etc.) and if the domain is currently owned. SEO is a pretty broad range of tasks that take hours each month so our SEO Services are a separate package. We do however build in SEO best practices like including your city in the page title tags, making H1 headers on each page, etc. A great website gives a great first impression but doesn't do any good if no one can find it. With any website, you won't get to the top right away. It actually takes a lot of work! We have separate Search Engine Optimization (SEO) packages for that. Our SEO plans range in price depending how aggressive you want to be and how long of a commitment you can make. You can do SEO yourself, it just takes a while to learn it. Will my site have HTTPS (ie a secure certificate)? Yes, your site will be secured with HTTPS, meaning all communication to and from the server is encrypted. This offers more security as well SEO benefits. Does website design include logo design? No, you will need to provide your own logo. InterNACHI and ASHI design free logos for their members. If you're not a member of either, sites like Fiverr are great for hiring logo designers. Is this for any kind of website, no matter the size? No, this price is for a high-quality website for the average new inspector. There is a max of 10 pages. Check out our demos below for examples of the work we do. Anything in excess can be custom-quoted, though we often will refer you to web design shops that specialize in custom work. Can I bring in an existing site? It depends. Certain Wordpress themes like Divi can be imported into our network. If we cannot import an existing site, sometimes we can use it as a reference for a new site. Custom rates may apply. If you choose to leave our hosting platform, we'll provide you a data export of all the content on your site that you own rights to (i.e. your text, images you have provided, etc.) This may not include themes we have paid commercial licenses for, stock photos we have provided, or plugins we have paid commercial licenses for. 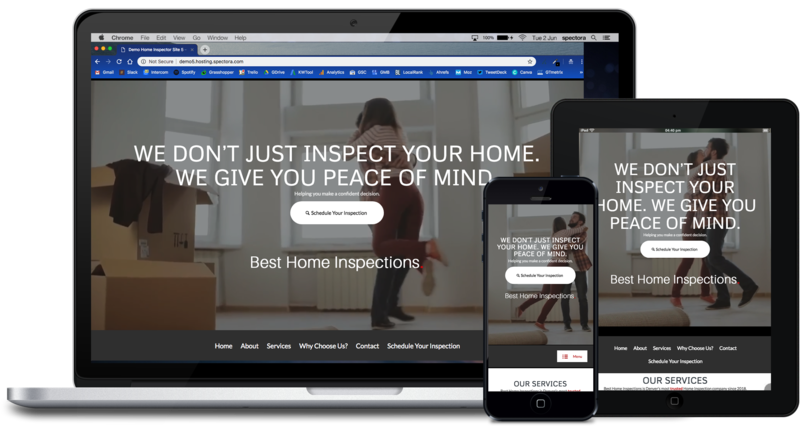 If you want to set up your site elsewhere, you'll likely need to hire a web developer to help get it set up, which is beyond the scope of our services. Our system uses something called "WP Multisite", which enables us to do security updates across our platform much easier than having unlinked stand-alone sites. However, be aware that this makes it necessary for a web developer to have deeper knowledge of Wordpress to take your data and set it up elsewhere. It is outside the scope of our services to assist with setting up your website elsewhere. Let me just say WOW. You so nailed it. Seriously could not be more impressed. We will have pictures for you this week to make it more personal, and some suggestions will follow, but.........I was SPEECHLESS when I saw the site! Kevin, I’ve been meaning to tell you this because it happens often. (It just happened again this morning). I asked my client how they found me and he said his wife went online and looked at three home inspection websites and ended up choosing me! I have you to thank for that. The site you did for me has paid for itself many times over. Great job!! I have spent a fair amount of time looking at web sites of other local inspectors and some not so local. I feel that the quality of my site is above par and I am very satisfied that I choose Spectora. I'm happy to see that the work you have done for my web site is on par with the quality and expertise I have come to find at Spectora. Most of the time, results like this, are because someone is working late at night. Thanks so much! Nice work Sarah! I just had my website launched yesterday and just wanted to tell you how impressed I am with Sarah and Laura. Sarah built me a beautiful website that I've already received a ton of compliments on. It fits my style perfectly and it's so easy to navigate. I LOVE it! She was very easy to work with and quickly made all the corrections I had. Laura launched the website and was extremely helpful. She quickly corrected an issue I had in regards to what came up on a google search. She even noticed and then let me know that my business email was due to expire very soon. Sarah was amazing throughout this entire process. She took all my needs into consideration and put things in the correct spots to make the site most effective. Her willingness to work with me and patience made what I thought was going to be a painful venture quite easy and actually fun. The end result is that I could not be happier with the way the site turned out or with your customer service. You have some very talented and friendly people over there and I look forward to years of business together.